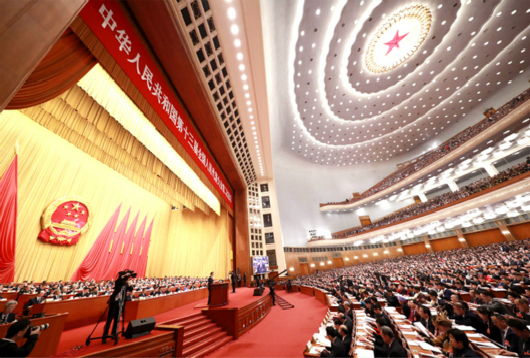 Chinese Premier Li Keqiang delivered a government work report at the opening meeting of the second session of the 13th National People’s Congress at the Great Hall of the People in Beijing on March 5. The report sets targets for economic and social development in 2019: GDP growth of 6–6.5 percent, over 11 million new urban jobs, a surveyed urban unemployment rate of around 5.5 percent, a registered urban unemployment rate within 4.5 percent, a CPI increase of around 3 percent, a reduction of over 10 million in the population of rural poor, and a drop of around 3 percent in energy consumption per unit of GDP. Gao Peiyong, a member of the National Committee of the Chinese People’s Political Consultative Conference (CPPCC) and vice president of the Chinese Academy of Social Sciences (CASS), said that many of the macroeconomic policy measures in the report are what people have expected, and some have even exceeded expectations. For example, according to the report, this year’s fiscal deficit is expected to increase by 380 billion compared with last year’s, and its proportion of GDP is expected to rise to 2.8 percent from 2.6 percent last year, Gao said. Local government special bonds are expected to increase by 800 billion yuan over last year for the construction of local key projects. In terms of reducing tax and fees, the report has proposed to reduce the burden of corporate taxation and social security contributions by nearly two trillion yuan throughout the year, Gao continued. Value-added tax will see further reform, and the current tax rate of industries such as manufacturing will be reduced to 13 percent from 16 percent. Gao pointed out that the main contradictions in China’s society have changed in the new era. The main contradictions in the economic field are structural problems and supply-side problems, rather than economic aggregate and demand-side problems. As socialism with Chinese characteristics enters a new era, economic growth has entered a new era as well, its basic representation being the shift from a stage of high-speed growth to a stage of high-quality growth in which quality and efficiency are highlighted. In the past, GDP was the focus of macroeconomic policy, and a demand management policy was implemented. At present, Gao said, both the government work report and the Central Economic Work Conference have proposed a supply-side structural reform as the focus. “If you look at the highlights of this year’s macroeconomic policy with reference to the above representation of the new era, you can come up with a different interpretation,” Gao said. In terms of fiscal deficit, the deficit rate is scheduled to be 2.8 percent this year, keeping it within 3 percent, instead of the over 3 percent advocated by many. This has played a role in stabilizing expectations and growth, and preventing risks. Zhou Hong, a deputy of the National People’s Congress (NPC) and director of the Academic Division of International Studies at CASS, said that the most noteworthy item in the report is this year’s strategic positioning. The first strategy is to coordinate domestic and international relations. The report proposes sound, high-quality growth. That is to say, development is still our priority. Development is the basis and key to solving all problems in our country. The second strategy is to balance the relationship between stable growth and risk prevention. The third strategy is to handle the relationship between the government and the market. The most impressive aspect of the report is its focus on the people, observed Zhao Guoxiang, a NPC deputy and Party committee secretary of Henan Normal University. The ten key tasks for 2019 set in the report are, ultimately, the pursuit of happiness for the people. He Tiangu, a member of the CPPCC National Committee and director of the Literature and History Research Institute of the Sichuan Provincial People’s Government, said that the government work report is closely related to the masses and to the people’s livelihood, giving attention to child care, fair and equitable education, stable employment, elderly care, and food, shelter and transportation. The most important thing for the next step is the implementation of these policies.